The prestigious Dances with Films film festival recently announced Beacon Point, the highly-anticipated science-fiction thriller from rising newcomer Eric Blue, has won a plum Friday night slot on the festival’s exciting showcase of upcoming independent gems. The Georgia-produced chiller, produced by Blue Lantern Films, will play the Chinese Theatre on June 10. 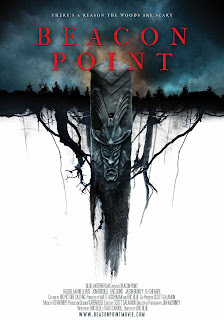 You’ll never want to go camping again after sitting through Beacon Point’s unnerving 85 minutes. We spoke to castmember Eric Goins ahead of Friday night’s screening. How did you get involved in the film, sir? Like all aspiring actors, I auditioned for Beacon Point. A few years prior to auditioning, I worked with Blue for the first time on short called, This Side Up. It was love at first shoot. When Blue told me that he was writing a feature screenplay, I immediately knew I wanted to be a part of it in some capacity. Blue put me through a pretty rigorous audition process (I'm assuming the other cast members were also put through it and that I was not some sort of amusing past time for the producer and director) and booked the role. The rest is unfolding as I type this reply. What was it that initially appealed to you about it? Working with Blue on a feature film was a top priority for me. And then when I got to read the script for the first time, it was as if he had taken every personal nuance, vulnerability and even some of my colloquial expressions and injected them into the role of Dan. Obviously, I am a self-preoccupied actor forcing those connections but I found a lot of myself in Dan and I wanted to explore it. IT's not like Blue has been watching me for years and secretly scrap-booking my personality traits and idiosyncrasies for his script, right?......Right? The setting was intriguing to me, as I have always had a mystical perception of the Appalachian Trail and the suspenseful nature of the story line was extremely attractive. And finally, I appreciated the ensemble nature of the cast. It's really a story of 5 people sharing in an experience, all of whom have their own challenges and vulnerabilities. Was it filmed in your neck of the woods or require you to relocate? I spend most of my time in Georgia right now while devoting stints of time in Los Angeles as necessary. We shot Beacon Point mostly in Georgia. It’s our home turf and we were excited to support Georgia businesses and crew members. Georgia production took place in Atlanta, Conyers, and Blairsville. For ease of access, we shot all of our night scenes at the Georgia International Horse Park. The waterfall scene was shot on private land, yes, we had permission, and it is rumored to be the largest waterfall on private land in the US. We also shot on location in North Carolina in the Great Smoky Mountains. This is where the story is based and it was crucial to show the immense size, beauty and isolation of the area. What other movies do you have coming out this year? I have few projects coming out this year. You add a great comedy element to the movie. What's your background with comedy? Accepting a partner’s “offer” or idea is followed by adding a new “offer” or idea, typically building upon the earlier one, that acknowledges and enhances previously established information. The fundamental principal of acknowledging and accepting information offered by a partner(s) unleashes a collaborative method of creative conception. For me, improv is life and comedy is currency for securing a happy one. “We don't make mistakes. We just have happy accidents.” Bob Ross From "The Joy of Painting"
Can you tell us what it was like working with director Eric Blue, being a first timer? Working with Blue was really terrific. He brought the whole cast together days before we began shooting so we could get to know each other and develop REAL relational dynamics off-set that eventually found their way on camera. He also gave a great deal of space for all of his actor to work while maintaining a laser point focus on the overall story. He left room for life to happen in the set. Blue is very good with PEOPLE - hearing them, bringing them together, talking to them, understanding them, engaging them, including them, leading them, motivating them, and empathizing with them. What more could you ask for in a director and project partner. The film is having its world premiere at the Dances With Films festival. How important are festivals to Indie films? Festivals are extremely important to Indie films. It's where the rubber meets the road and allows filmmakers and actors to engage in a raw experience with the AUDIENCE (the most important element of any film) to gain critical feedback. On the business side, theatrical distribution is no longer the definitive way that movies make money. Festivals present a different way to circulate a film, ensuring that it is seen by both the public and industry professionals.